My quest continues for the best Hainan chicken in LA and Orange County. So far, Savoy Kitchen in Alhambra is still the king of Hainan chicken, but who wants to drive to LA? 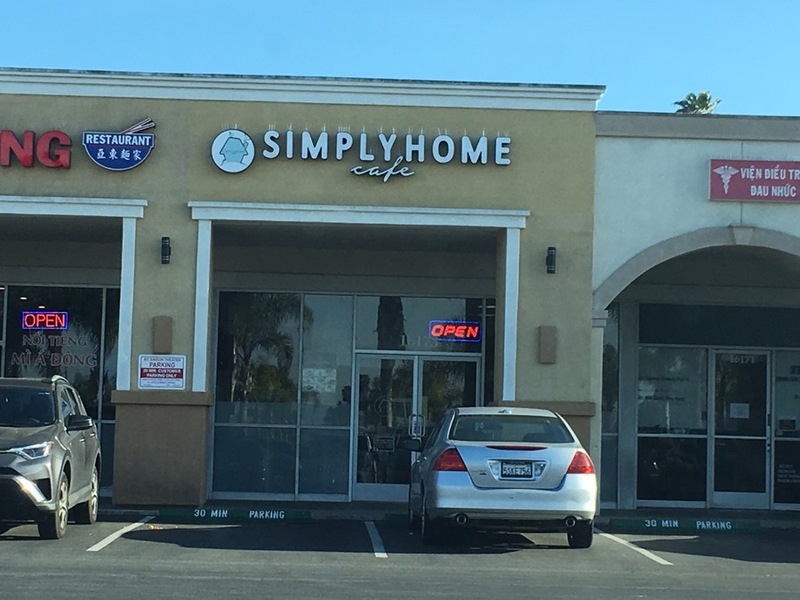 Located off Brookhurst and Edinger, down the street from the heart of little Saigon is this little café. It’s tucked away in a shopping plaza near a Denny’s and across the parking lot to the future home of a new Brodard Restaurant. This place has been open for about three or four months. They’re still going through growing pains, so I’m giving this place a lot of slack. The menu is small, but has something for everyone. They have 3 versions of Hainan chicken (rice, noodles and wrap) and they have soup noodle dishes, rice plates, snack food, and the Asian tea drinks. If you check into yelp, you can up-size your drink for free. I chose the jasmine milk tea, slightly sweet, and it was perfect. The prices are on point with the local competition, and the drink portion was generous. For this visit I went with the signature Hainan chicken and rice, while Karen had the Hainan chicken with noodles soup. The chicken was very tender and the portion was generous… However, the rice was just ok. It could have been more flavorful, perhaps more ginger or broth? A bit underwhelming. Before ordering my food, I looked at the various yelp comments and knew the Hainan chicken was served on the bone. So I asked no bones for either dish. For Karen, I knew she liked dark meat, but I asked mine to be mixed. The white meat was perfect, but I think the food could have a little more flavor. I’m not sure what’s missing. It wasn’t missing the salt, but maybe more ginger? Karen also said the same for the noodles soup. She doused her bowl with the provided ginger – soy dipping sauce, which normally she wouldn’t do. The staff was friendly, and I could not complain about the service as we were the only ones there at 5:30 PM. Food came fast and the staff checked up on us frequently. There’s plenty of parking, and they offer a punch card for drinks. There’s still lots of room for improvement. I hope they tweak what they need, especially since there’s another Hainan chicken literally down the road.